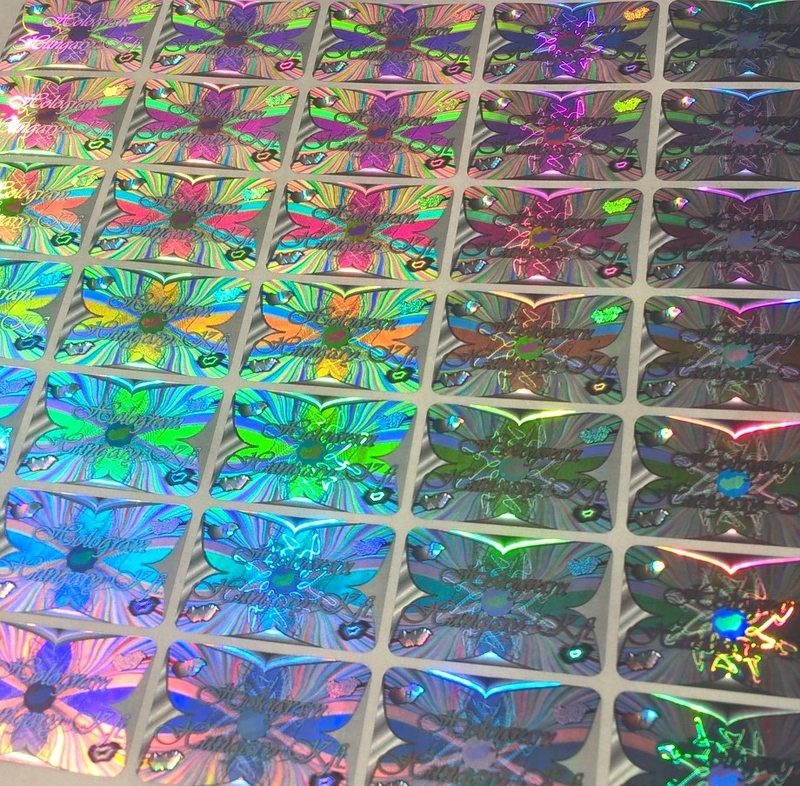 Hologram Hungary custom label - The best security labels in Hungary | Hologram Hungary Ltd. The best security labels in Hungary. 1. 3D Background: The lines in the background give depth to the hologram and the tunnel effect attracts the eye to the middle. 2. 2 Channels: Very impressive effect, this case you can see Hungary from one side and Europe from the other, depending on the viewpont. 3. Guilloche: Generated by a computer algorithm, in this case a spiral line design. It cannot be reproduced without knowing the original algorithm. 4. Colour digital effect: Located in the lower "triangle" is one of the simpler effects, responsible for the rainbow color on the hologram. 5. Focused colour digital effect: Contrary to the colour digital effect, this element can be focused, making the background more spectacular. 6. 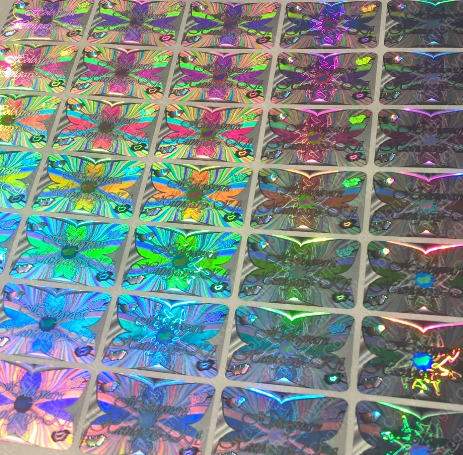 Metallic digital effect: The metallic matte effect does not contain the usual rainbow colour of the hologram, providing a completely new, modern experience. 7. Colourless white: This special matte white effect does not seem to be aesthetic although it is quite important, for this offers a surface to print bar codes or QR codes when it is important to identify the individual labels. 8. Lens effect with text: Generally a circular 3 dimensional effect where the circle resembles a magnifying glass. Complete texts can be written with several adjacent lens effect with text elements. 9. Shrink-expand effect: A pulsing effect, primarily a hologram characteristic as it is very spectacular. 10. 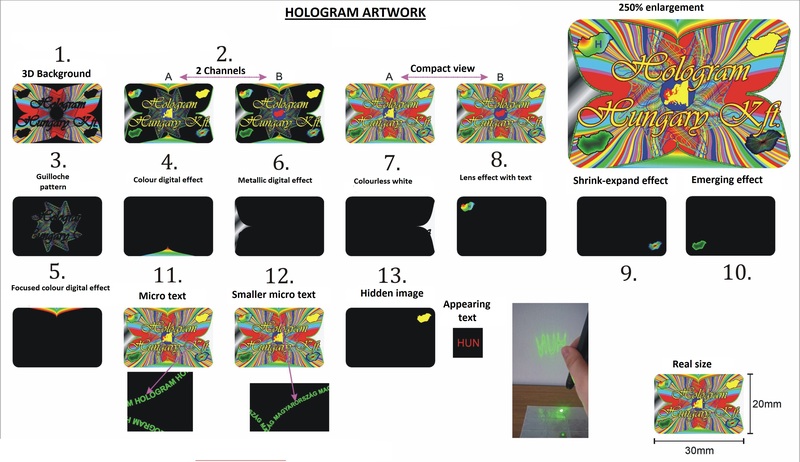 Emerging effect: This element gives the illusion of a convex surface as if the hologram was embossed. 11. Micro text: The most popular security element, legible with a magnifying glass. 12. Smaller micro text: This "nano text" is approaching the forensic level, the 50 micron letters are only legible through a magnifying glass if the person has good eyesight. 13. Hidden image: Projects the text "HUN", and you can obtain it by fitting a clear surface (paper or wall) perpendicular to the label, then point a laser to the hidden image's position. This will project the text's or the image's reflection. 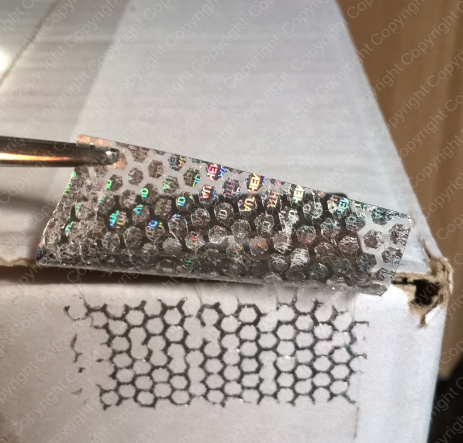 The adhesive of the label itself has honeycomb tamper.